In bone tissue engineering (BTE), 3-D printing is a reliable and customizable method used to repair bone defects by producing biomimetic tissue scaffolds. In a recent study published online on Tissue Engineering Part A (Mary Ann Liebert, Inc), Qing Li and a team of scientists engineered a biomimetic substitute closest to the natural bone structure and composition for bone grafting. For this work, they used two different types of hydroxyapatite (HA) materials: nanohydroxyapatite (nHA) and deproteinized bovine bone (DBB) dispersed into collagen (CoL) to prepare a bio-ink and engineer composites of nHA/CoL and DBB/CoL as 3-D printed scaffolds. The aesthetic reconstruction of functional alveolar bone is challenging after bone loss due to trauma, inflammation and surgery. Materials scientists can combine tissue engineering and biomaterials to promote alveolar bone regeneration; an increasingly popular theme in regenerative medicine. The past decade has seen significant advances in 3-D printing technology for customized bone defect repair with successful clinical translation using metal laser printers. The merits of 3-D printing largely include low complication risk, short operational time and good molding during surgery. The biodegradable properties of materials can guide bone regeneration in situ. Among the available techniques, low temperature 3-D bioprinting (LT-3DP) is optimal for alveolar bone reconstruction, as it can generate a specific 3-D blueprint of the patient's bone defects for reconstruction. The LT-3DP system can engineer multiple polymer-mineral composites with enhanced material properties. The resulting 3-D porous scaffolds can mimic bone architecture for conductive cell-matrix interactions and allow efficient blood vessel growth for advanced BTE. The polymer material nHA selected in the study is a good candidate to substitute for natural bone, due to its high osteoconductive activity. The natural DBB is an alternative xenogenous bone material, morphologically and structurally similar to human cancellous bone. In the present study, Li et al. successfully replicated a previously established protocol for DBB preparation. Type I collagen (CoL-1) is the most abundant structural protein in the human body and was therefore best suited to generate composite polymers in the proposed experimental setup for constructs with enhanced biomechanical properties. Li et al. prepared and categorized the bio-inks to three groups as CoL, nHA/CoL and DBB/CoL in the study. 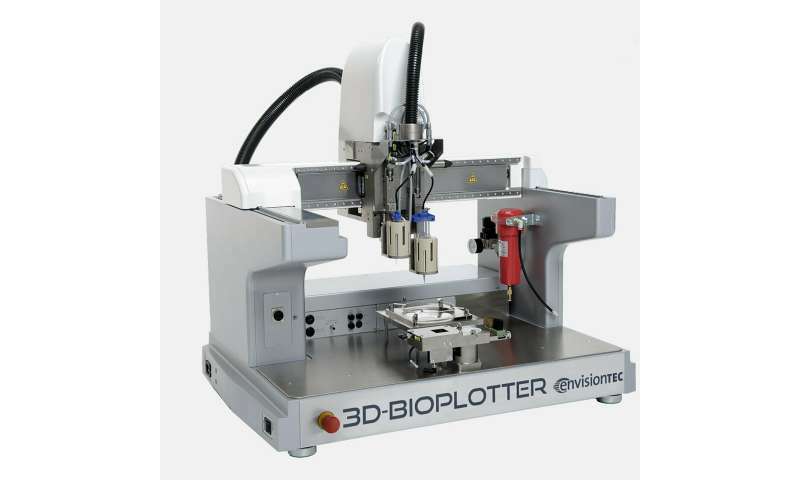 To engineer the composite scaffolds, the scientists used the 3-D bioplotter (EnvisionTEC, Germany). After printing the 3-D scaffold, they constructed a grid-like microarchitecture with pore widths of 600 µm. The internal honeycomb microstructure represented typical characteristics of cancellous bone. The materials scientists first tested the physical and chemical properties of the two material composite scaffolds (nHA/CoL and DBB/CoL), followed by their biocompatibility and osteogenic impact on bone marrow stem cell (human BMSC) differentiation during cell-material interactions. The scientists used standard methods of materials characterization such as X-ray photoelectron spectroscopy (XPS), X-ray powder diffraction (XRD) and Fourier Transform Infrared spectroscopy (FTIR) to understand the consistency of the two composites, as well as their diversity relative to chemical bonds and crystal phases. They used scanning electron microscopy (SEM) to obtain imaging results, which showed different surface morphologies of the HA crystals and scaffolds as factors affecting the internal porous structure of the product. Specifically, the Young's modulus of the nHA/CoL group (7.9 ± 0.3 MPa) was higher than both CoL group (3.5 ± 0.4 MPa) and the DBB/CoL group (4.5 ± 0.7 MPa), indicating higher stiffness of the nHA/CoL composite scaffolds. For biofunctionalization studies, Li et al. 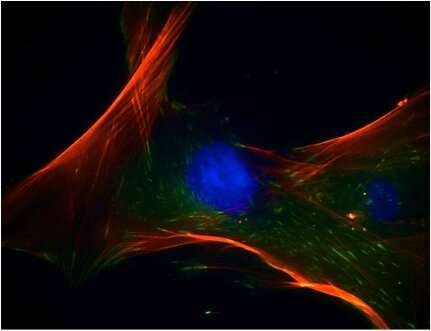 showed that the two composite scaffolds equally supported cell proliferation via immunofluorescence staining. For this, they used fluorescently tagged antibodies to stain and microscopically identify hBMSCs growth on 3-D printed surface structures. During cell culture, the scientists used an osteogenic induction medium (OM) and proliferation medium (PM). The alkaline phosphatase (ALP) staining method used to determine stem cell differentiation, indicated the expression of ALP in the OM group, but not in the PM group. The scientists conducted real-time polymerase chain reaction (RT-PCR) after extracting total RNA from the stem cells (hBMSCs). The results showed the expression levels of the osteogenesis-related genes of interest examined in the study. In comparison with the PM groups, the genes related to early and late osteogenic differentiation; Runt-related transcription factor RUNX2, SRY related HMG box gene 9 SOX9, osteocalcin OCN and CoL1A1 in the OM group significantly increased after 7 days. In this way, the researchers demonstrated osteogenesis and increased effects of extracellular matrix formation for hBMSCs cultured on the bioplotted 3-D scaffolds to confirm surface biocompatibility. Li et al. showed that the physicochemical and biological properties of the 3-D bioprinted scaffolds containing nHA/CoL or DBB/CoL were well suited as bone substitute materials (BSM) in bone tissue engineering (BTE). 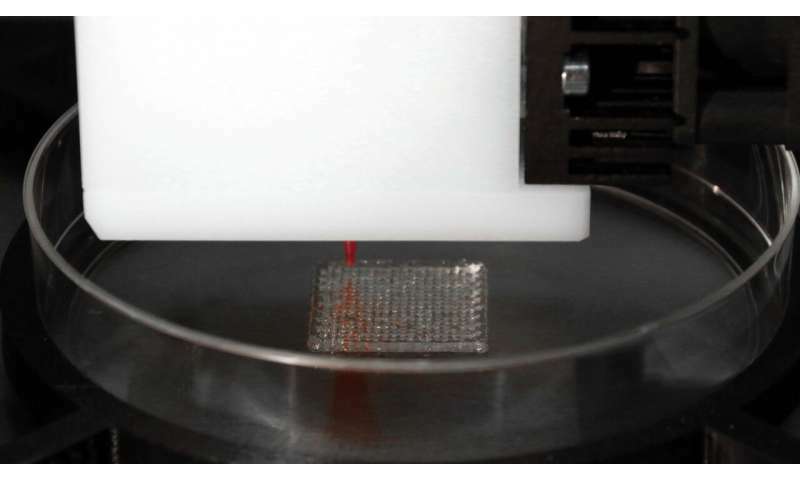 The ability to easily print 3-D customizable scaffolds can have potential for translational research from the bench to preclinical studies and to the clinic in the future.